Auricular Medicine as developed by Western medical doctors in Europe is a complete modality of diagnosis and treatment. Unlike body acupuncture, auricular medicine is treating the central nervous system rather than meridians. As a reflex map of the brain, the ear holds a current read-out of the whole body system, and is a gateway for both assessment and treatments. Auricular medicine can successfully treat most conditions, including otherwise inaccessible conditions affecting the inner organs and central nervous system. German Auricular Medicine is a system of auricular acupuncture that grew out of the discoveries of Paul Nogier, M.D., of Lyon France in the 1950’s to 1980’s. Recent advancements to the medicine have evolved in Germany, the central catalyst being Dr. Frank Bahr, a student and colleague of Dr. Paul Nogier. Thousands of European medical doctors, and now hundreds of North Americans, have been trained in this relatively new German system of the medicine. 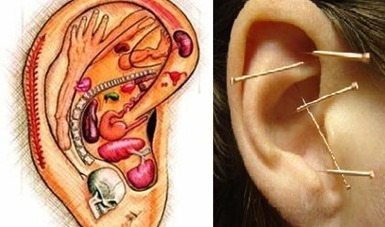 Advancements offer the practitioner the ability to not only use the ear for diagnosis, but also to determine the priorities amongst active acupuncture points. The result is an individualized treatment plan that provides an effective pathway for recovery. The ear holds the story, and reveals the trail back to health. The brain is dynamic, always projecting current disturbances as “active” points onto the ear. Going far beyond the use of basic 2-dimensional ear maps to locate points, learning to accurately read the ear itself brings these active points alive, and guides the trained practitioner’s assessment. These “current disturbances” we see reflected on the ear can also be long-held and even ostensibly unimportant pathologies or injuries. Physical or emotional scars, or hidden dental infections, for example, may still be presenting a constant stress to the system. Our bodies do not stop trying to heal, to regain homeostasis, and if there is a blockage preventing the natural process of response, that pathology will continue to demand energy. It then becomes an energy drain, or “focus” for the body, preventing other injuries to heal as well. A precise assessment and treatment can “reset” the related and specific brain area, rewiring and sending a new message to the pathology in the body or the psyche for deep-seated issues such as chronic pain, trauma, concussions, internal scars, hormonal imbalances. It can also quickly and effectively treat symptoms, or treat an area of the body with tissue damage that prevents local treatment. With such a safe, non-invasive system, we can and do change people’s lives; sometimes with single treatments. The ear offers us the most direct and effective gateway to treat the brain, other than invasive methods such as implants or other surgery. Increasingly, spinal cord or brain surgery is being tried for chronic conditions such as migraines, Alzheimer’s’, anorexia and epilepsy, when trying auricular medicine first could avoid such drastic measures.